Folks who feel they are being steam rolled into building a “Taj Mahal” library and moving the Literary Cabin tell us there is one final shot at being heard by the City Mothers and Fathers. You can also attend the meeting, but good luck at being able to speak. It just seems a criminal waste of money to move that building — original estimates said $350 k and now are 650 k according to today’s Idaho Press. The whole library structure as conceived is out of proportion with our needs. At some point, Team Dave will have its Waterloo. This may be it. If a referendum were held on moving the Cabin to the park and building a new library-Mahal, how many Boiseans would actually vote Yes? 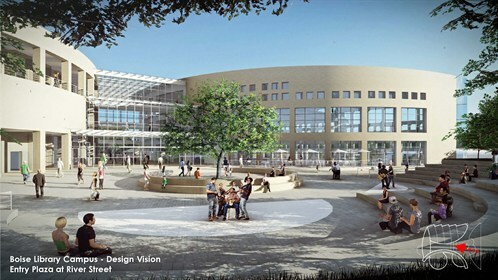 Regarding the proposed design of the new library, is the Simplot JUMP Center metastasizing? Council “leadership”—mayor, pres. & pro tem, who run the show at city hall—once again offer the pretense of taking public comment and nothing will change. I vividly remember when the Salt Lake Hardware Building became the Boise City Library. Boise citizens were thrilled to have this attractive brick building and the large amount of space inside for library patrons. Because of the brick exterior and the parking spaces, we believed it would last forever. Little did we know that the City would someday consider replacing it — and that someday has now arrived. Please, please don’t do this !!! I encourage everyone sending email feedback to also submit letters to the editor of local papers so that the full and valid criticisms of this project are heard by all. Mayor and Council need to be held accountable for their lack of regard for or inclusion of public opinion in recent major public works projects. They will hear our voices at the polls in 2019; I just hope it’s not too late to stop this $100 million pending disaster before then. $100 Million for what most of us have a library it’s called Google.Leave the Log Cabin where it belongs. Take a million and build our library “up into the sky.Once again offer the pretense of taking public comment and nothing will change as many other things in the past!Where is the $100 million coming from? For a $100 million the citizens of Boise should vote on it! From what I understand, Boise needs a new big library to meet the needs of the varied citizens that use it. However, there are also a lot of other needs more pressing in our city. Affordable housing, the homeless situation, public transportation (or lack of), infrastructure. Helping the downtown rather than raising parking rates to the absurd. I would rather our tax dollars go to societal issues as opposed to a Taj Mahal building. I found the architect to be totally out of touch with Boise…probably because of who he had been discussing the project with. Pompous a** immediately came to mind. I think a more inclusive, well rounded committee is needed to discuss the issue of a new library and the other issues of our great city. Building a $100m library is like building a pyramid – an archaic ego project for Pharoah Beiter that is a total waste for everyone yet built by the masses. The library online content is dismal and could be increased 100x for that money. Who doesn’t have a tablet, computer, or phone? Even the homeless have smart phones now. I agree with “prediction” above. The mayor and council will stack the deck somehow so whatever is said will make no difference and they will proceed. They don’t listen now why should they change? Any public comment period is just so they can check they box that says they did it. Nothing more. First, from the city I would like to see some stats on foot traffic and book loans from the Library! at the current location. I assume they have this information. If library usage is up significantly over the last few years, maybe a new and larger Library! is justified. Secondly, I would like to know how the city is going to pay for it. I assume that the cost of a new library exceeds what the city has in its cash account, so where is the money coming from? Is the city going to pursue a bond issue to finance it? I oppose state and local governments going into debt for any reason, but especially for a white elephant like the proposed Library! and uprooting of the Cabin. I want a VOTE on the library!!!!! This mayor and council will never let you vote! He is soooooo much smarter than you he does not need to know what you think. He can also manipulate his massive city budget to hide,rat hole and shift millions of dollars and you have no ability to find it or track it. So all in all you are out of luck. This is a prime example of taxation without representation. Boise’s elected public servants aren’t even willing to have the comments received at their offices? Could that be an indication that our elected public servants are spineless? We need public servants, including elected ones to work for the public FULL TIME. As we open our current tax bill for the year we’ll realize the need to demand spending for projects NEEDED for our community and not WANTED by elected public servants. This includes parks, libraries, public safety facilities and vehicles, public art, major equipment, and major repairs and maintenance (MRM) are accounted for in the Capital Fund. Primarily supported by money from the General Fund (taxes), Development Impact Fees, bond resources, and donations/contributions. Other capital improvement projects for airport, geothermal, and sewer are covered by the Enterprise Funds. The increase in the 2019 Capital Fund is entirely attributable to the Main Library Project at $69 million. In 2020 another $11 million is to be allocated to this project and $5 million was already allocated for the planning & design in the 2018 budget = $85 million. * Coordination With Other Projects – Desire for another parking garage? It is important that the five-year plan remain balanced . . . to ensure that the projects within it remain relevant and represent the highest and best use of the City resources (p.138, 2018). A key component of keeping the fund in balance includes maintaining sufficient reserves, preserving flexibility to respond to unanticipated needs or emerging priorities (p.140, 2019). In 2020, the fund is projected to go into a negative position due to higher expenditures for the Main Library project than the fund can support . . . Before 2020, project tradeoffs or alternative revenue sources will need to be identified to ensure the planned projects, major equipment, and MRM expenditures can proceed (p.140, 2019). Since the city gets the majority of its revenue from property taxes, has Team Dave planned for what could happen if property values and tax revenues fall? The city’s accountants need to perform a stress-test on the city’s finances to model a case where property prices fall 30-50% or more. That is a scenario that could play out during the next recession, particularly when interest rates continue their upward trend. Increasing outlays for a new Library! while revenues decline would be a perfect storm for the city. Instead, now would be the perfect time to add to the city’s financial reserves and cut expenses in order to weather a recession that is probably in the near future. I know the financial documents are audited, but I do not recall coming across any mention of stress-testing protocols. If this does occur, it seems contradictory to allow the fund to go negative, especially when the City budget speaks of keeping the fund in balance by maintaining sufficient reserves. The City’s 2017 Comprehensive Annual Financial Report (CAFR) mentions the likelihood of a recession at some point during the five-year forecast period (p.38). The 2018 CAFR has not been released yet, as the fiscal year just ended on Sept. 30, but this issue will most likely be addressed again. When the next recession occurs, which it will, as this tends to be part of the normal cycle of economics, this will impact nearly all of the City’s revenue streams – just as this did in the years following the 2008 debacle. If property values decline, they just raise the levy rate and go merrily along. Raising the levy rate does not make up for the total loss in revenue when assessed values decline during a recession. The State limits the annual increase to 3% regardless of what the economy is doing. So although they can up it each year by 3%, which they usually do, this does not fill the coffers back up to what they would have been when the assessed values were higher. Going back to 2008, as the assessed value on my property declined each year, the taxes also went down – not proportionally to the loss in assessed value, but this did mean the City would have taken an overall hit on total revenue collected across the board. What E. Harter expressed concern about in the earlier post was the City living on the revenue it is use to today, essentially finding a way to spend it as fast as it has been increasing each year. Rather than setting some of the surplus money aside for a rainy day when the revenue stream declines – which would be fiscally responsible with the taxpayers purse. I thought tuat the 3% cap applied to the budget increase rather than the levy rate. EDITOR NOTE–Erico, you are correct. In good times the budget hike usually is similar to the levy rate. The increase is limited to “3% plus the value of new construction.” That NEW CONSTRUCTION can be worth a hefty amount in boom years. My earlier post was referring to the 3% state limit allowed for the budget, not the levy rate, as the levy rate is calculated by the tax commission after the City submits the budget; I should have included “budget” in the sentence. These amounts are in addition to the $114 to $128 million in base tax increases during the same time period. Instead of saving some of this surplus, it appears spending it and then some is the game plan. The City’s financial documents show clear cut plans to go negative in the Capital Fund account as a result of this expensive library project. $1.8 million in the hole for the 2019 forecast, with financial projections of the economy continuing on the upswing in 2019 to bring this negative amount to “only” $45,620 in the hole for the 2020 forecast. And that is IF this project stays within the $80 million currently allocated for it. What happens if/when this cost goes off the rails as what occurred with the Fire Station projects? We do not need a new fancy library. We need more satellite libraries or improve the satellites out there already. This is a showpiece for Team Dave to point at in legacy. Besides, the time is coming when all books with information contrary to official narratives will eventually be removed from libraries the way that Big Tech is censoring dissident platforms that merely tell contra narratives. What good will a library be then? Are your tracking about the personal social credit score FB and Google are helping Commie China to create? All the data on Americans needed to erect the same scoring system in the USA has been collected, they’re just waiting for our next democrat president to approve. It’s why the swamp dwellers are so frustrated by 2016 outcome and totally freaked that RBG will be replaced by Trump. Democrats will be our end. Useful Idiots as the Bolsheviks called them. Libraries good, but we have enough. This $$$$$$$$$$$$$$ Taj Mahal plan is a monument to Bieter, nothing more. Selfish Jerk. I think the library manager is giving these wedgies, not the mayor. He’ll (mayor) have to pay for it. But why circumvent the public process? That is the transgression and the question. The pubic needs to buy in, or out. If it was 40 million, or 20, it would be different. Did you folks realize under the current library scam, (before this new scam happens), did you know the library is getting 60% as much money as ACHD from household property taxes? Look at your tax statement. WTF?!?! Who are the idiots who are approving all this waste?? ?